From age 65 onwards, your muscle mass and strength drops by 40 to 50%, you experience more shortness of breath, and weight gain is common. Your balance is increasingly shaky, so the danger of falling becomes more common. It is then that your autonomy is called into question. Beyond impacting your physical condition, falling can also have psychological consequences with varying degrees of seriousness: loss of confidence, fear of falling again, withdrawal, etc. To delay or avoid this inevitable path to dependence, gentle exercise remains one of the keys to aging well. HUBER 360® EVOLUTION proves to be the ideal functional tool to remain active, mobile, and independent. With its different accessories (guardrails, special stool, etc. 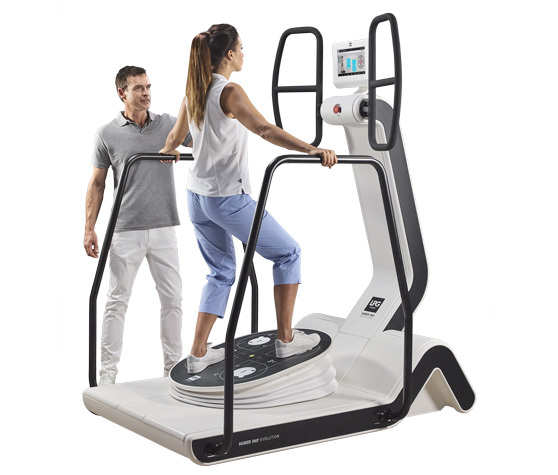 ), this state-of-the-art technology offers exercise that can be adapted and personalized for anyone..
- Standing exercises that mobilize all joints and that gradually strengthen muscles in a targeted way to improve balance and restore the range of motion. Other more dynamic exercises (tailored to the physical condition) might be done to increase the ability to tolerate fatigue so as to maintain good cardiovascular health..
- Seated exercises work on abdominal muscles to correct posture. Moreover, using the target games on the screen, HUBER 360® EVOLUTION stimulates cognitive abilities to improve concentration and coordination, thus limiting the dangers of falling in everyday life. The machine allows to exercise the whole body, which is essential for good mobility. HUBER® is wonderful. I use it a lot, and I’m very pleased with it. I believe that I’m alive because of it! I was rather unlucky in illness: I had strokes, I had operations, I had a heart attack. This machine balances me from head to toe! When I train on it, my whole body responds! HUBER® has given us amazing results. It allows the patient’s stimulations to be concentrated. In a single 15-minute session, we can fight both sarcopenia and osteopenia, and provide the patient with a interesting cognitive stimulation. It’s a very comprehensive machine. It’s so fun that patients ask for more. This tool also opens a new way for us to care for patients who are doing well except for some minor problems walking or keeping their balance. With two sessions a per week, we can do preventative work to give them a sense of security and thus to postpone the falls that are, unfortunately, often the beginning of a downward spiral. As for lower back pain, certain patients got rid of aching pains this way and regained their self-confidence.